Homeschooling is not free, in fact it can get very expensive, and very quickly. It can be a lot less expensive as long as you visit the local library and utilize some of these free resources listed below. Some of these are amazing, and I can’t believe I haven’t heard of them until I started researching more. When I started out, it was going to be a list of 25 resources, but it quickly went up to 50, and that was just from memory. I decided to dig deeper. As I read more and more about, the list kept growing. It has surpassed 100 resources at this point! I will add more as more of these wonderful resources come to my attention! Lesson Pathways offers an entire K-5 curriculum and homeschool planner at no cost. Clickschooling: Be sure to check out Clickschooling for many curriculum ideas. CK12 is another considerable resource where you can build your curriculum and find free online textbooks. SAS Curriculum Pathway has many resources for various subject and age groups. As the description on their website states: free learning for K-12 and beyond. Easy Fun School has unit studies for everyone: from home economics to mathematics. Just fyi, it seemed to work better for me from Explorer, not Chrome. Easy Peasy All-In-One Homeschool Curriculum. Smart Tutor has many great free resources as well, including a K-5 curriculum, free educational games and more. Little House Kindergarten is perfect for families with the littlest kids that feel like they need something more organized. Currclick. I have only recently found out about Currclick, and what an astonishing website it is. I can’t believe I haven’t heard of it until recently. There are just so many options for every subject on there, many of which are completely free. E-Learning For Kids offers help in an array of subjects: Math, Science, Environmental Skills, Computer Skills, Health, Language Arts, and Life Skills. Khan Academy. Who hasn’t heard of Khan Academy? It is probably one of the best and well known resources for teachers, parents, students, and anyone who is passionate about education. HippoCampus provides thousands of videos on various interesting subjects. Education.com has many worksheets on every subject, but that’s not all they have: there are activities, crafts, lesson plans and more. Open Culture is a fantastic resource. You truly need a lifetime to go through everything they have to offer. If you would like to learn anything, and I mean anything, look there first! Brainpop is a fascinating website, providing classes, quizzes and more on many subjects. It is aligned with common core and the current education standards. You can read more about it here. Be sure to check out Discovery Education. They have so many free resources for teachers, parents and students! Teachers Pay Teachers has a plethora of free downloadable lesson plans designed and loved by teachers nationwide. Also be sure to check out this Free Teacher Resource. It has free lessons, activities, calendars, brain teasers and more. Just fyi, most of the open college credit courses are for the purpose of gaining knowledge, so the vast majority do not have college credits. As I did more and more research, I found several books that have to do with College Level Education that I would love to check out (probably from my local library). They are both by Jennifer Cook DeRossa, one is Completely Free Colleges, and the other is Homeschooling For College Credit. Udemy offers a ton of courses free of charge. To see what they offer, just go to browse their courses, click on the topic you wish to explore, click on “all courses” tap on the right, then select the *free button. For example, here are some free music courses you can take with Udemy. They also have phenomenal sales, where you can buy an expensive course for about $10.00. Another thing about Udemy is that you can take the courses anytime. Coursera also has many classes on every subject imaginable. However, the courses are usually provided by another entity, like a college, a university, another company, and most have registration dates. Future Learn also offers free courses on a variety of subjects. Saylor Academy offers a list of amazing college level courses that you can do at home, complete with final exams. Kaplan University Open Learning seems very interesting. MIT Open Courses are great for high-school, college, and just anyone that wants to learn something new. Study.com has a lot of courses on quite an amount of subject matters. Stanford Online offers a lot of free college level courses. Open University also has over 800 free college courses. Open Yale Courses same as the previous universities, open college level courses. I would love to recommend this book for learning how to play piano at home: The Older Beginner Piano Course by James Bastien. It is easy to pick up and follow, even if you know nothing (and I mean NOTHING because it worked for me) about playing an instrument. Drawspace has an extensive list of astounding and wonderful art lessons for any age and ability. Art For Kids Hub has lots of videos showing how to draw in a very well organized step by step instructions. Next one is Happy Family Art. It has several art lessons for a variety of media. NCH Video Editing Software is an amazing, wonderful software for an aspiring movie makers. It is easy to learn and very intuitive (I speak from experience). It is also free to use for personal use. If you can’t afford Photoshop for your Graphic Artist, give Gimp a try. Free to use and comparable to Adobe Photoshop. It is a fantastic software. Jerry’s Artarama has a ton of art lessons and videos to learn from. KinderArt has an amazing selection of art lessons for the young ones. Crayola has an impressive amount of lesson plans for all your art making needs. Don’t overlook this great resource. Online Free Spanish just as the title suggests. The website looks visually pleasing and kid friendly. Learn A Language has all sorts of options when it comes to learning a new language. Definitely a site worth exploring. Mango Languages is an amazing learning tool. We use ours through the library free of charge, and so far like it the most out of all the language programs we tried. However, even if your library doesn’t offer it, you can request it, or you can get their homeschool plan. BBC Languages introduces you to 40 different languages. Among them you will find French, Spanish, Greek, Arabic, Italian, Russian, Chinese, and so much more. Radio Lingua Offers a lot of audio and video resources for various languages. Much of it is free, though some requires a payment. DuoLingo is another great way to explore a foreign language. It is also free, and has a nice variety of languages. Scholastic has a ton of lesson plans for parents and teachers. Book Adventure is a great reading program: read books, take quizzes, get awesome prizes. Starfall teaches the little ones how to read. Teach Your Monster To Read does just that. Storybird is another excellent and fun place to explore. Write your own stories, and use existing art on Storybird (provided to you my man talented artists) to illustrate it. Creative Writing Prompts does just that: generates creative writing prompts. The Story Started has creative writing prompts for daily writing exercising. Inklewriter is another great writing tool that I am excited to try out. NaNoWriMo is a great one for the writers! Not only for November (the National Novel Writing Month), but for any time of the year. Roald Dahl Official Website: There is a slew of lessons based on Roald Dahl’s writing. Read Write Think has many lesson plans and resources for your classroom. At Read.gov you can find an immense amount of classical literature books. For more reading also be sure to visit the Open Library, which is just fantastic. While here, I have to recommend this book: 3D Game Programming For Kids by Chris Strom. While it is not free, it is well written with the audience in mind. My kids loved it, and were able to follow it on their own (at ages 8 and 13), and learned a lot with it. For the aspiring Video Game designers there is Game Maker Lite Software. It has a fantastic tutorial built in to help you get started. Unity is another game design software that is free to use at it’s basic level. We have found many Unity courses in Udemy and Youtube. MIT SCRATCH will help kids create games, stories, and animations and share them with the world. Flowlab Game Creator allows you to unleash your creativity by collaborating and designing your own games. A really fantastic site! Adventure Maker is very easy to use, and there are many things you can do with it. You don’t have to know a programming language to use it. Just check out their introductory video on the homepage to see more. Game Star Mechanic uses games and interactive fun quests to teach kids about the basics of game design. Code.org is designed for both teachers and students and teaches the fundamentals of Computer Science to kids. Codeacademy is also an interactive way to learn programming, though in the past I have found it to be geared toward a much older kid. Open Source has much to offer to a budding Computer Scientist. Physics Quest helps with teaching physics to the kids in a fun and easy to understand way. They will also send you an amazing kit to explore physics and help you navigate the world of physics. Their next kit goes out in January and the time to register is right now. From our past experiences, it is best for kids in the 7 to 12 range, but it all depends on the kid. Lego Designer allows you to virtually build your own dream model of anything you can think up! Nasa has a ton of options for educators. National Geographic For Educators has many amazing lesson plans and resources for teachers and students. Science Buddies has a lot of fun things to do with your kids! Who doesn’t love a great exploding science experiment. Science Bob shows your kids the science experiment and provides instructions on how to make it. Math.com has so much math practice questions, you can study math from morning to night! How Stuff Works has a lot of exciting articles on what’s current in the scientific world. The Popular Science Magazine is another interesting place for the young scientist. The Science Spot has many great lesson plans for junior-high students, and many resources for teachers. Astronomy Magazine answers many questions of the budding astronomers in your home. Big History Project looks absolutely wonderful. Lots to learn and explore. You can use it as a teacher or as a student. Smithsonian is an amazing place to explore online with your homeschooler. Kids.gov is a great addition to your homeschool social studies curriculum. Maps 4 Kids helps the kids get a better understanding of the world through maps, geography and games. Google Earth. I can’t say enough about how much we enjoy Google Earth software. It’s free, and amazing. With it’s help we have seen so many amazing places! If you are looking for more history, this is a great list of e-books of old knowledge of 100 years ago. Have Fun With History is chuck full of streaming documentary videos, activities, links and more. Library of Congress is another fantastic resource for any homeschooler! PaperToys is quite fun and awesome: print, cut out, fold and glue all sorts of paper toys. From car models and building, to dogs and cats, you will find it there. Make sure to join the Homeschooling Buyers Co-op. It is free to join, and offers discounts on all sorts of educational materials. Including ID Card template that you can use to design and print your homeschooling ID Card. 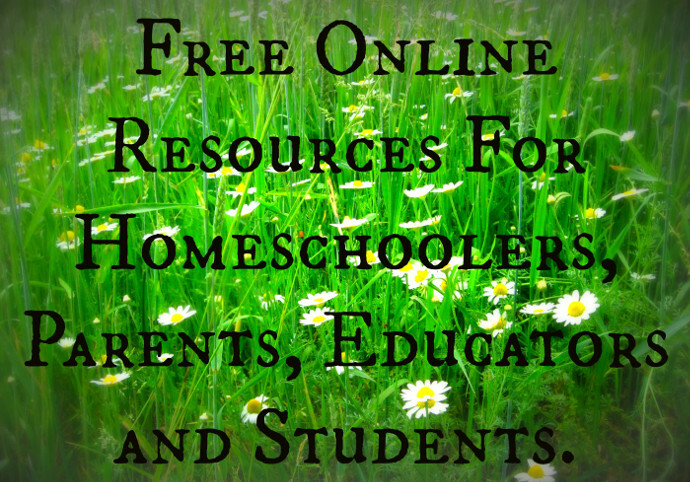 A2Z Homeschooling offers a truly impressive list of resources. Youtube is probably the most well known resource for everything!!! Need to fix a washing machine, look it up on Youtube. Solve a differential equation? Look it up on Youtube. Wikipedia is another big one. True, you have to understand that not everything on there is accurate, but it’s a great source of general information, and a wonderful stepping stone to learning more about any subject. Oh my!!! How come I didn’t know about this until I started writing this article. Ted-Ed has video lessons on so many amazing subjects!!! Including this awesome lesson on Vedic Math. Want to make something exciting? Go to Instructables for all the instructions you will need. From baking a cake to building a go cart, you can find it there. Don’t forget to visit the homeschoolers best free resource: Your Local Library! Do you have any educational free resources that you use and love? If you do, please share in the comments below! I am so glad you enjoyed these! It addresses a growing category of homeschoolers, who are not necessarily non-religious.